It's taken me awhile to actually sit down and write my sweet London's birth story out and I imagine it will take awhile to write it completely! In every way London's birth story was completely different than her big brother's birth story. As much as that annoyed me at the time, I kinda love it because it just shows she is her own person and I have no idea what to expect..lols. I am a such a control freak. Lord help me. But through this entire pregnancy and birth and obviously in the days to come, I am learning that, I am so not in control. All of this was a reminder that God is in control...I can trust Him. He knows what He's doing. I do not know best, ha. Okay, on with the birth story. *Trigger warning* London's birth story was a bit crazy and could cause some stress to pregnant mommas or people who have had birth trauma. The end of September was an insane time for us. James had just finished some huge painting jobs and then put a ton of time into the recording of our church's live album (October 1st). I did everything I could to not induce labour during that week, because it would be verrrrry complicated if she decided to come on live recording day! Thankfully she didn't come then. For some reason October 3rd was stuck in my mind as a special day. My mind was thinking maybe labour would start or she would be born that day...but that day turned out to be the day where I said goodbye to my beloved Nanny Rosa. My beautiful 93 year old grandmother passed away the next morning and I was so glad I got to say goodbye to her. The funeral was the following week and my brother and sister in law were flying in from NYC so we hoped and prayed London would be born before then......but no. My due date (October 7th) came and went. I had various contractions that would go on for a few hours and then fade away....that was SO annoying....especially when they would wake me up in the middle of the night. The next week I tried to enjoy my time with James and Luca but I was getting cranky. London had moved position and was putting constant pressure on my left hip and lower back...basically I hobbled around like an old lady in so much pain until she came....that was the WORST. My grandmother's funeral was on the 12th and honestly, I was glad that she hadn't come before then. I had spent so much time and energy focused on waiting for London that I hadn't had a chance to grieve my Nanny Rosa. As hard as that day was, it was a good day surrounded by family remembering our amazing matriarch. Following the funeral, I was sooooo ready for her to come. I did alllll of the things too. I drank tons of Raspberry leaf tea, bounced all the time, did birth preparation yoga everyday, walked as much as I could (my hip was still so sore), nested, cleaned like crazy, everything except for castor oil and pineapple because I'm allergic to the latter and won't touch the former..ha. But nope, little lady still stayed inside. I was awful to be around. Poor James. We were trying to enjoy the time together as a family of 3 but I was such a basket case. One minute I would be bawling and the next I would be angry at everything. I was mad at God. He wasn't answering my prayer and I didn't know why. In those 12 days of being overdue I had a couple non stress tests and ultrasounds to check on things and sadly for me (but good obviously) baby girl was happy as a clam. She was average weight, she had regular fluid, she had a great heart rate, which all meant that I was low priority to being induced. My doctor put me on the induction list on day 10 but because I was such low priority, it could be days. They booked me another non-stress test for October 20th and I cried. Surely baby girl would come before then!!!! And thank goodness she did. I had my next doctor's appointment at the end of the day on October 18th. I went not expecting anything because I did not want to get my hopes up. As I was waiting in the waiting room I overheard the hospital calling my doctor's office....they wanted to check on my induction and let my doctor know that a bed had come available! A lot of normal inductions happen as so....you go to the hospital, they insert cervidil in you and then you go home and wait for the contractions to start, do early labour at home and then go back to the hospital when your contractions get strong and close together. My doctor informed me that I could not be induced this way because London's head was very high....aka it could be very dangerous for me to be at home because she could potentially drop quickly and the cord could become wrapped around her neck...and I'm SO thankful for the wisdom of my amazing doctor as you'll soon see. I needed to be induced at the hospital on Oxytocin where I could be monitored....but I needed to be progressed a little further for it to work properly and a bed needed to become available at the hospital...hence why I had to wait so long. So back to the doctor's office...she checked me and hallelujah I was 2-3cm dilated!! London's head was still high but things had progressed enough that they could induce me that night. I texted James to get care for Luca and grab our hospital bags! What a whirlwind that was. It felt surreal driving to the hospital with no contractions....with Luca, I was DYING on that drive. Because of the time, we hit rush hour traffic so I'm very thankful I wasn't in actual labour, ha. We made it to the hospital just after 7pm. They checked me in, prepped me for the induction and by 8pm I was hooked up to Oxytocin. Now some people respond very quickly to the Oxy but for me it was slow and steady. While it was kicking in, I walked around the ward with James, bounced on the ball and read Harry Potter. I even rested for a bit as I was soo tired. Around 1am the contractions got stronger as they kept upping the oxy. The nurse (who was with us the whole time and was flipping amazing!!!!!) said our goal was to have some solid contractions at 2-3 mins apart and once they were consistent we would call my doctor to come break my water. Those started around 2:30am. They got stronger and stronger and around 4am I asked for my epidural. The nurse checked me just before and PTL, I was at 5cm. I should also mention that sometime around 3, London switched positions and I suddenly had back labour....which is the absolute worst. I had it with Luca so I knew what it felt like. All before 3am she was in a good position and I could handle the contractions so much better. With Luca I LOOOOOOVED my epidural. It allowed me to rest while my uterus did it's thang to get me to 10cm dilated. James and I both napped for hours and I got the rest that I needed for labour. This time around, things were a bit different. I still received that sweet, sweet, relief from pain (VIVA LA EPIDURAL!) but a little while into it after my doctor had come to break my water (around 6am I think? ), things got a little stressful. London's heart rate kept dropping every contraction. I could tell there was a bit of concern on my nurses' faces. Someone came to take some blood from me incase I needed an emergency c-section. I felt the stress but just tried to pray through it and trust that God would take care of my little girl. Throughout the whole pregnancy I always reminded myself that Luca was my promise (read more about that here) and London was my miracle. From her conception to unexplained bleeding to test results to so many other things, I just knew she was my miracle from God. So through alllll of those things, I had to keep declaring that she was my miracle. She was a gift from God and He would keep her safe. Just before 7am I felt the need to start pushing. I honestly thought it would take waaaaay longer to get to that point because it took hours with Luca...I felt not ready at all. They checked me and discovered I was at 10cm...pushing would happen soon. At this point I felt so exhausted as I had practically been awake all night and the night before that I had a horrible sleep. I don't know if it was the sleep deprivation or stress or whatever but I suddenly felt SO anxious...I kept telling my nurse, I can't push for 3 hours again (like I had with Luca), I can't do it..I think I may have started crying at this point but I honestly can't remember....and then all of a sudden I NEEDED to push. Now this part feels like a complete blur. I pushed with all my might and London came out in 6 sets of pushing...17 minutes. I knew something wasn't right as the room filled up with people...I think James counted 9 medical staff! It was not the same calm atmosphere that was present at Luca's birth. It felt chaotic but that doesn't mean that God wasn't there. I'm so thankful that He can be present in ANY situation. Even through the craziness, I felt His presence so strongly. London came out with the cord wrapped twice around her neck. My doctor had to act fast and cut the cord before the rest of her body came out. She made a tiny noise and then they put her on me and she became limp. They quickly took her to a cart in the room and the medical staff started working on her. Thankfully, after a minute she started breathing and cried that beautiful cry that you want all babies to cry. Through that minute I just kept praying and praying and declaring and declaring. My doctor was incredible and calmly assured me that she had a strong heart rate and would be ok. I cannot express enough how much I love my doctor and all the nurses and peds staff who were in the room. Seriously, they are super heroes. After they got her breathing and checked her out, they gave her to me. Because everything was pretty traumatic, I can't remember much about that time except that I kept thanking God for her and that she was flipping so beautiful. She was born with a full head of dark hair just like her big brother. She weighed just under 8lbs and was 20cm long...just perfect. Thankfully recovery for me the second time around was SO much better. I was up and walking in a day and the only pain I had was my hip...which thankfully has just resolved! As hard as it was being TWELVE days overdue, it all happened in God's perfect timing. If I had gone into labour at home and my water had broken, things could have ended completely different. Once again, I was reminded that God is in control. He knows what He's doing and I can trust Him completely. 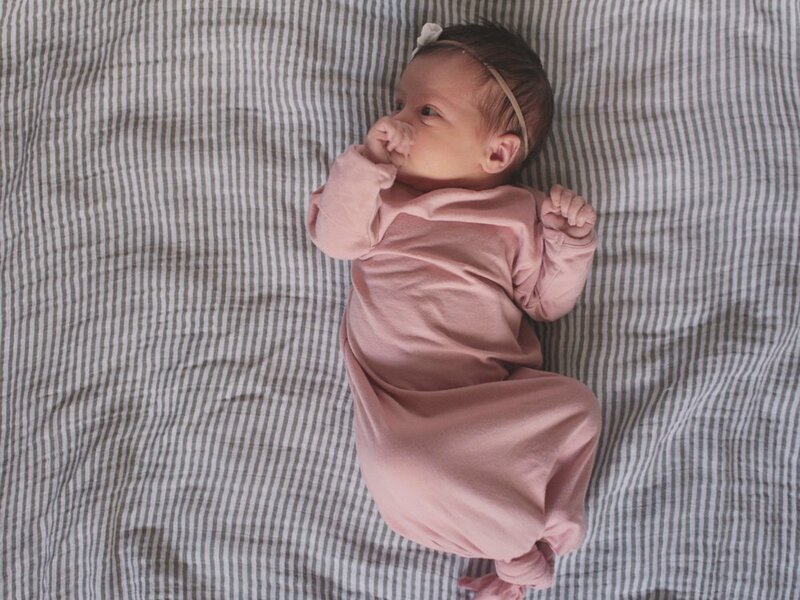 We are SO in love with our sweet London Rose. She was dedicated at our church when she was three days old and honestly, I get so excited thinking about all the things God has in store for her. I'm believing he has big, big plans for this little lady. We're almost three weeks in with her and have started adjusting to a family of four...it's overwhelming at times but so surreal and fun too. I'm so thankful for my two treasures, what a blessing they are. Sorry for the lengthy post, ha! If you made it this far, you deserve a prize! !